"Hemispheres" is Lily Afshar's fourth and most ambitious recording to date. In her search for new music, Lily discovered a wonderful array of composers, some of whom have written compositions especially for her. The result is "Hemispheres", an intriguing collection of pieces performed by Afshar and written or arranged by international composers including Reza Vali, Ricardo Moyano, Gerard Drozd, Carlo Domeniconi, John Schneider, Leo Brouwer, Garry Eister and Morteza Neydavood. 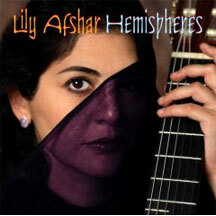 Lily Afshar's "Hemispheres" presents a truly original sound (including the incorporation of quarter tones) that promises to be a significant addition to the contemporary classical guitar repertory. Hailed by the Washington Post as "remarkable, impeccable," Lily Afshar is head of the guitar program at the University of Memphis. Chosen as Artistic Ambassador to Africa for the United States Information Agency, her numerous awards include three consecutive annual "Premier Guitarist" awards from the Memphis Chapter of the National Academy of Recording Arts & Sciences.